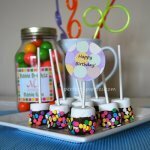 Carnival Game Ideas for birthdays and other celebrations. Tailor it to your theme or party occasion. 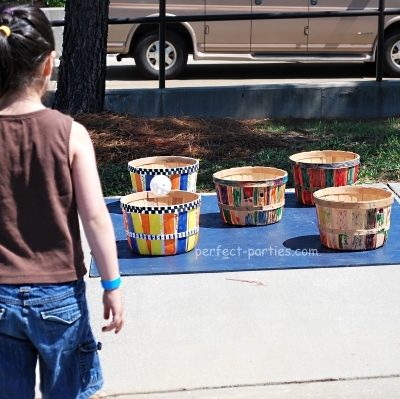 This carnival game is perfect for young toddlers but enjoyed by any age. All children are winners! Just pick a duck and win a prize. Fill tub or pool with water. Mark the ducks underneath with a numbers 1-4 or however many prize buckets you want to have. Mark each prize bucket with a number corresponding to one on a duck. Example if you number ducks 1-4, then you need four prize buckets. Return duck for next child's turn. 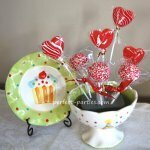 Get a pre made game or make your own and decorate according to your party theme. 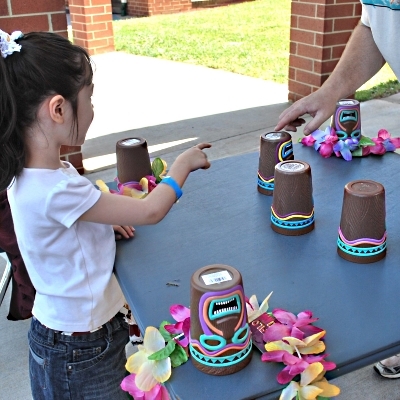 This carnival game can be played indoors or outdoors. 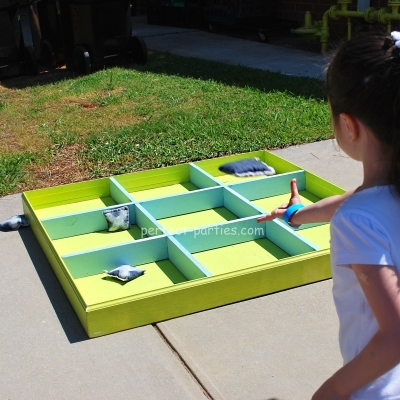 Buy or make a tic tac toe board. Three in a row wins! Adjust distance to age group. You can make your own bean bags if you have a sewing machine with scrap material and fill with rice. Find five baskets and decorate with colors of your party by coloring, painting or print and attach some pictures on the front of each basket. Give each child 5 balls or bean bags. Determine how many must make it into the baskets to win. Adjust according to age group and ability. 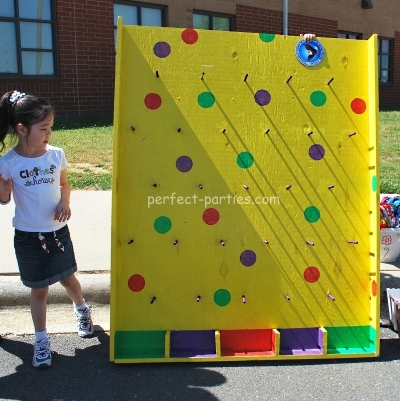 Here is a home made game board to play plinko for those of you who are handy! It was a big hit with kids of all ages. Drop the disc from the top and the number slot it lands in, is the bucket the child selects the prize from. You can make it smaller for young children and use coasters as game pieces. Easy to set up game using a fish tank, jar, water and pennies! 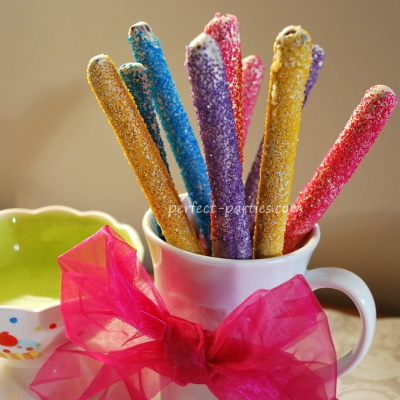 Great for an ocean theme party or an outdoor party with carnival style games. Drop pennies and if it goes into the jar, it's a winner. 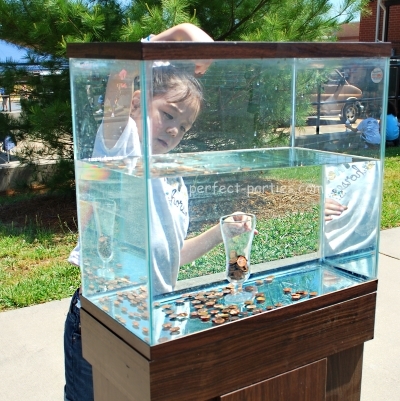 Weigh down jar with pennies or aquarium gravel or pebbles if needed. It's tricky so consolation prizes are a good idea and maybe two jars to drop pennies into. Adjust water level to make it easier or harder. 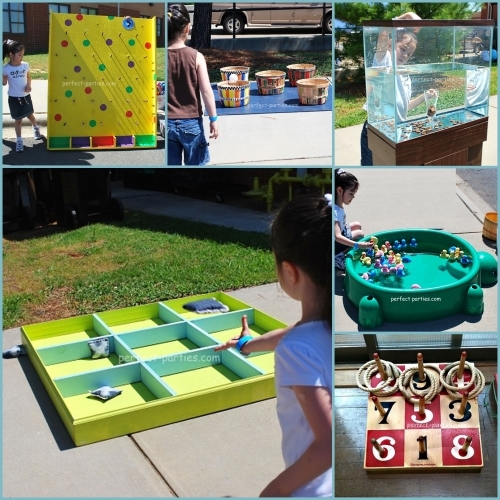 Easy to set up and all ages can play. Give each child 3-5 balls and putter. Show how to hit, and explain you don't need to hit it hard or you'll be chasing balls. For younger children use practice plastic golf balls instead of real balls. Have prizes for everyone who tries. This is the classic ball and cup game where you shuffle the cups with a ball under one and the child guesses which cup is hiding the ball. Show the ball and place under one cup. Shuffle the cups and have the child guess which cup the ball is under. Can adjust number of shuffles according to age. Good for all themes. Find plastic cups at the Dollar Tree and other $1 sections in Target or WalMart to match your theme. 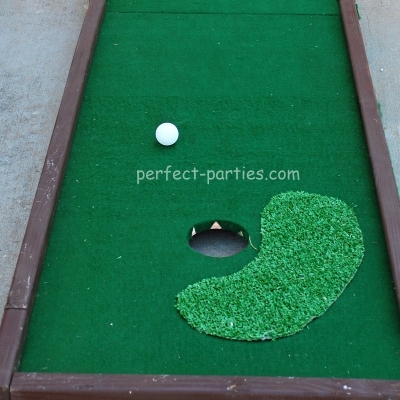 Make a bean bag toss board and decorate with your party colors or you can find some premade. 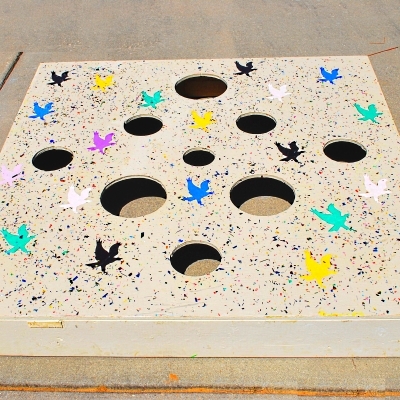 Decide how many you need to get in the hole to win. Test to see how difficult it is to get the bean bag in...this is more challenging than the tic tac toe bean toss. This is a simple game with one die, die cast cars and a game board. Game board made out of wood, cardboard or you could laminate card stock or similar. 1 Die (large is easiest) You can find some at education stores where they sell game pieces. 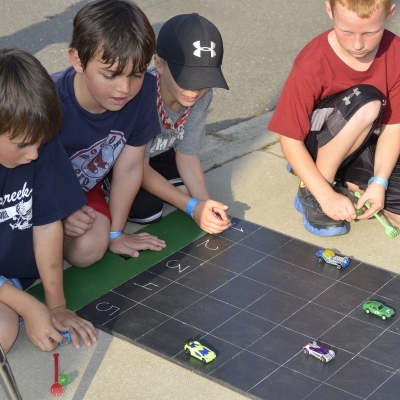 Players select car and put at the starting line. Player rolls die on turn and moves car the number of spaces on the die thrown. Racing Flags make cute prizes or decorations. 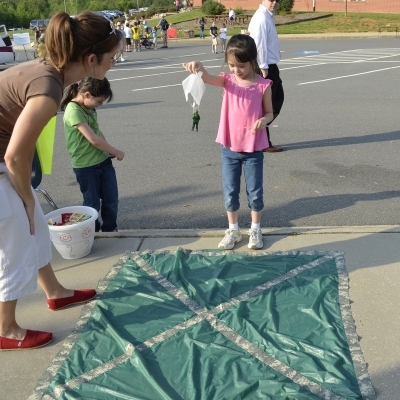 Drop a parachute onto a quadrant and depending where it lands, determines which prize. Tarp or Landing Area of your choice. Players drop parachute man onto game mat. Depending where he lands, determines which prize is selected. Number the quadrants so children can try to aim at a certain one. For a larger mat, use a parachute with colors as different quadrants to land your pieces on.